COP24 was my sixth. My first attendance at the annual meeting of the Conference of the Parties to the United Nations Framework Convention on Climate Change was COP3 in Kyoto in 1997. There, for the first time, world leaders agreed a Protocol to start reducing humanity’s emissions of greenhouse gases. Nineteen years ago, I went to present the latest scientific results on planetary warming at a relatively small conference centre from a table in the main lobby. 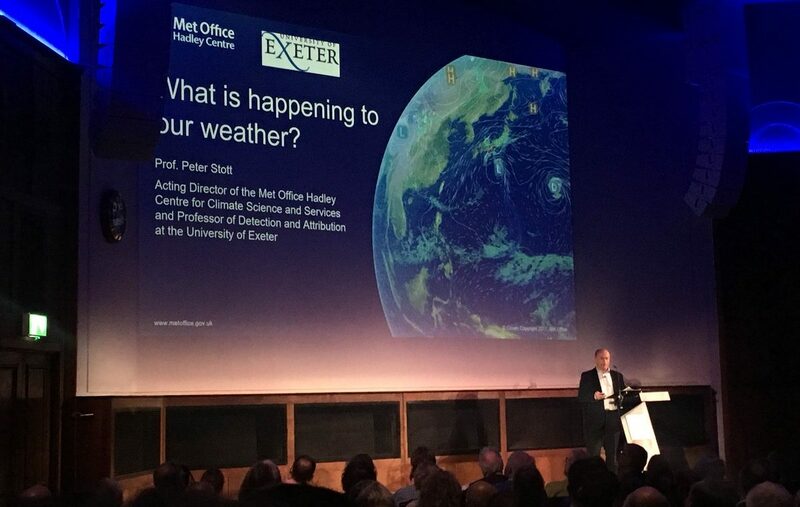 The two of us from the Met Office Hadley Centre were the only climate scientists presenting results directly to delegates at the meeting. But thanks to the work of the Intergovernmental Panel on Climate Change who had assessed our work and that of many other researchers, politicians knew enough to act, even then. Frustratingly, through the succeeding two decades as I travelled to COP9 in Milan in 2003, COP17 in Durban in 2011, COP19 in Warsaw in 2013 and COP20 in Lima in 2014, greenhouse gas emissions and global temperatures continued to rise. In a ground-breaking deal agreed at COP21 in Paris in 2015, world leaders committed to preventing global warming reaching dangerous levels. It felt like, at last, the political will was there to deal with climate change. Now three years on, I arrived in the Polish coal mining town of Katowice to present our latest scientific results. Our analysis showed that human-induced emissions had increased the chances of 2018’s heatwave in the UK by thirty times. Elsewhere that summer, extreme temperatures caused widespread fires, many deaths from heat stress and substantial damage to crops and livelihoods. All the scientific evidence points to dangerous climate change being with us in the here and now. The Paris agreement that aims to keep global warming to well below two degrees Celsius relative to pre-industrial levels and to try to keep it to below 1.5 degrees is designed to stop that dangerous climate change getting so out of hand humanity can’t cope. As I showed in another of my presentations at COP, this time presenting the latest analysis by the World Meteorological Organisation, global temperatures have already reached 1 degrees Celsius above pre-industrial levels. There is a massive urgency to start reducing our emissions. Time is running out. At each COP that I’ve attended the atmosphere has felt different. In Kyoto back in 97, there was a fevered air of excitement as negotiators raced towards a historic agreement to reduce emissions. But without progress towards meeting the Kyoto protocol, the atmosphere at the Milan meeting in 2003 felt listless and flat. A catastrophic COP15 at Copenhagen in 2009 took international efforts to deal with climate change to a new low. But COP 17 in Durban felt more hopeful, and by the time I went to Warsaw and then Lima the mood around the conference seemed much more purposeful. Countries were working towards the historic Paris meeting. It felt like the tide had turned. In Katowice, the mood in the air of the vast conference complex seemed to have switched again, and now seemed fractious and edgy. Tens of thousands of people, negotiators and journalists, lobbyists and scientists, had gathered in this chilly and drab city for a meeting supposed to agree the “rule book” by which the Paris aims would be met. But three years on from Paris, the very latest data showed global greenhouse emissions had reached a record high. The Paris aspirations had to be turned into progress on the ground, and fast. Doing so, and without any further delay, had begun to seem like a tall order. I spent much of my time in the huge tented structure that had been set aside for the “side-events” hall where I was involved in three different presentations of scientific results. This aspect of the conference had grown massively from its incarnation I had encountered four years before in Lima. The Peruvian version had been a series of tented rooms with chairs. The Polish version had become something else entirely. There was live music in the bright custom-made country pavilions and in the early evening tables of wine and nibbles came out. A constant flow of talks, films, food and drink tempted the never-ending flux of delegates milling past the colourful flags and slogans to stop by and partake of the freebies on offer. A country’s pride was on sale or a lobby group’s mission was touting for supporters. It was loud and it was always busy. In the presentation space of the UK pavilion, which came with several rows of benches in front of a large television screen, I presented my results on the UK heatwave in one presentation and in another our latest work on providing scientific advice to help make societies more resilient to the effects of climate change. Even amplified through a microphone it was hard to be heard over the constant, noisy hubbub from the crowds milling around us. The ambience that had been created in this garish trade fair seemed designed to make us focus on the bright, shiny, noisy present, rather than the difficult choices we all face in future if we are going to combat the existential threat of climate change. If delegates wanted considered reflection, they were going to struggle. For that they needed to look elsewhere. I found it in a quiet corner of the Side Events Hall, in a walled off room, where the clear star of this conference was taking part in a panel on the value of storytelling for helping solve the climate crisis. She was Greta Thunberg, a fifteen-year old Swede with plaits and Aspergers who had reached worldwide fame for going on strike from school. Now she had brought her fight for climate action to the government leaders who were supposed to be dealing with the problem, but had signally failed in her lifetime so far. The cameras had followed her here, as they had done all round the conference centre, reflecting a mounting fascination with such a slight figure having such a massive global impact. Hearing her answer questions from the floor, I could see why she was commanding such interest and respect. She was clear-sighted and determined, and she definitely wasn’t going to respond to a question with an answer designed to please the audience. Asked if she thought children cared more about climate change than adults, she said they didn’t. And they wouldn’t until their parents cared more. Her answer put the focus back on us, where it belonged, the supposed grown-ups. That’s what I learnt at COP this time. Change is coming whether our leaders, or indeed ourselves, like it or not. For over twenty years, climate scientists have been warning the politicians that they need to act to avoid dangerous climate change. The latest report from the Intergovernmental Panel on Climate Change that I saw delivered to the policy makers gathered in Katowice gives them, and us, a stark warning. There is little over a decade left before global emissions must be heading steeply downwards. Yet still, at COP24, the United States, Russia, Saudia Arabia and Kuwait repudiated the scientists’ findings by boycotting a motion at the conference to “welcome” the report. The childishness of these four nations’ leaders, who had previously approved the IPCC’s report but who now signalled they wanted no part of it, showed us Greta is right. It’s the people who are going to have to lead the change we need, not the politicians. They will act only if truly forced to by the people they are supposed to represent. Speaking as a citizen, and not as a scientist, the bad news about climate change is it’s down to us. That’s also the good news.